Round bale storage economics depends on a variety of issues. Investments in structures need a longer time to yield beneficial returns, while low capital systems can be used for a short period before they pay off. If a person will be in the hay storage business for 15-20 years, a building may be a good choice. If a person will be in the hay storage business for only 1-5 years, a building may not be a good choice. The type of hay storage to use is influenced by how long the hay will be stored each year and in what seasons. Dry matter (DM) loss of dry hay bales is a function of hay moisture, temperature, and how long the hay is exposed to those conditions. The higher the moisture and temperature, the higher will be the rate of decomposition. Large losses can occur in a short period under moist hay conditions (>30% moisture) when the temperature is high (>70°F). Even at a low rate of decomposition, a large quantity of hay can be lost over a long storage period. 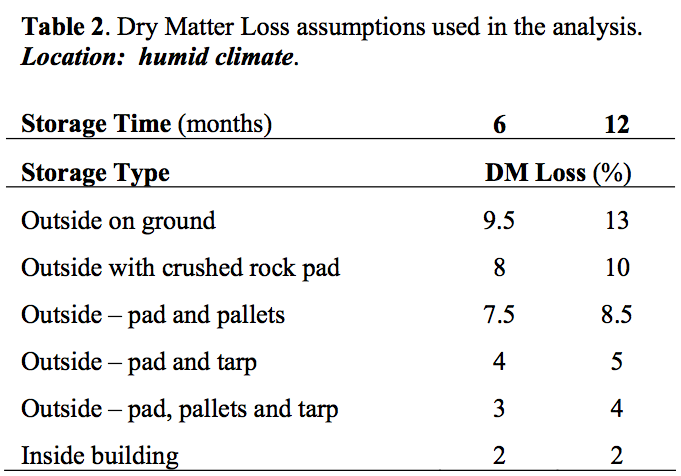 What factors influence dry matter loss in stored bales? Storing hay inside a building results in minimal DM losses of 1- 5%. Hay should be stored so as to reduce the exposure to moisture. Bales will absorb moisture from the soil if left outside on the ground yielding the highest DM losses (DM loss = 5-20% up to 9 mo. storage and 15-50% DM loss for 12-18 mo. storage). Even when covered by plastic tarps, contact with moist soil increases the DM loss compared to bales not in contact with the soil (DM loss = 5-10% up to 9 mo. storage and 10-15% DM loss for 12-18 mo. storage). Higher density bales tend to have lower loss values in the DM loss ranges listed above. Lower density bales will have higher losses in these ranges as they tend to absorb more moisture than higher density bales. Elevating the bales above the soil breaks the wicking action of moisture from the soil. This practice can reduce DM losses by an additional 2-15%. Uncovered round bales touching on the sides will hold water as it runs off and is directed into the bales. The worst case of DM loss occurs when low density bales rest on the ground, are not protected from precipitation, and are stored for a long period of time in a wet warm climate. Round bales shed water better than square bales which should not be stored outside without a cover. Small bales tend to have a have a large surface-to-volume ratio. Since outside storage exposes surfaces to high loss rates, large bales will have a lower DM loss than smaller bales. Densely packed bales shed more moisture than low density bales. If bales must be stored outside, use high density baling methods. Large bales are more susceptible to initial harvest moisture than are smaller bales because they retain moisture longer in storage. Dry the hay below 17% moisture before making large bales. Net wrapping helps bales shed precipitation better than those wrapped with twine. Flat hay blades like grass or sorghum will shed water better than coarse hay like alfalfa. A climate with high precipitation, relative humidity, and temperature has higher moisture hay and higher losses than one that is drier and/or cooler. Placing bales in the sunshine helps to keep them drier than if they are stored in the shade while outside. Locate outside storages at higher elevations, not in low lying areas toward which runoff drains. There are a variety of ways to keep bales dry when being stored in humid climates. Direct precipitation can be kept from the hay by placing the bales under roof, wrapping them in plastic or in net wrap, or placing the bales under a tarp. Moisture can be kept from wicking from the ground to the hay by separating the hay from the soil. Use plastic wrap, large crushed stone, ties and/or poles, pallets, or tires to keep the hay off the ground. The value of hay depends on what a willing buyer and a willing seller can agree upon. If you have to buy hay today, what would you give for it? If you wanted to sell hay today, what would you need to get for it? Feeding value (grass hay vs. alfalfa hay) influences the price as does handling and feeding convenience. Depending on the animals being fed and the other ingredients in their ration, the producer buying hay will be looking for a specific type and quality of forage. Large round bales tend to be discounted from square bales over the range of all feed values. What’s the economic return from various round bale storage systems? There are low to high capital cost alternatives for large round bale storage. The low capital cost systems often have high DM loss costs. One should consider both the initial captal investment as well as the annual cost which can include depreciation, interest, repairs, taxes and insurance on the capital investment as well as labor, equipment, fuel, plastic and DM lost. 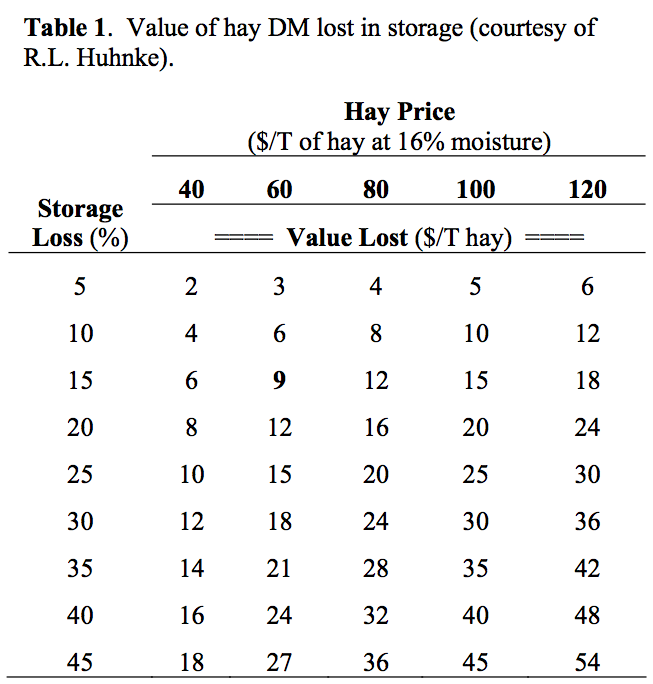 An example analysis presented below is based on typical DM losses for various storage alternatives used in a humid climate using plastic twine on tightly wrapped bales (Table 2). Use of sisal twine and/or loosely wrapped bales will experience higher losses of DM for bales exposed to the ground and precipitation. Location in a wet climate will experience higher losses while location in a dry climate will experience lower losses than those used here. Dry Climate = Western U.S.
Humid Climate = North Central to Northeast U.S. Wet Climate = South Central to Southeast U.S., Northwest U.S. Note the same 2% loss for a building with hay stored for 6 or 12 months. This means the annual cost for each system will be the same. Building costs are a function of size and construction type. 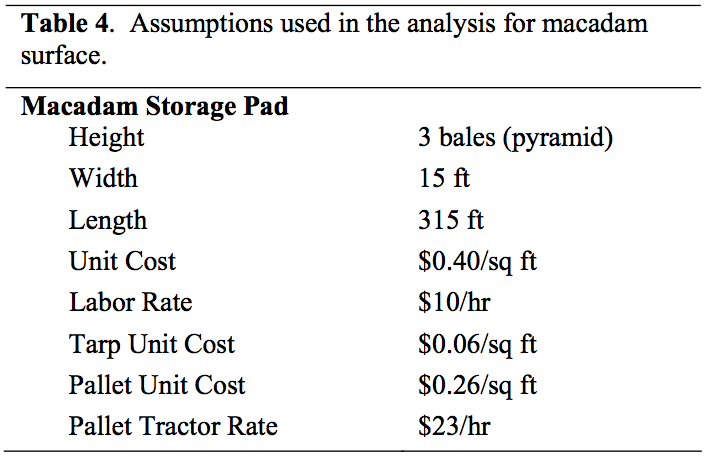 For this analysis, a builder was asked (in late 2003) to provide the cost of a hay storage shed without walls. The cost for a 30×40 ($8.45/sq ft for 12-ft walls, $9.12/sq ft for 14-ft walls) and the cost for a 40×90 ($5.56/sq ft for 12-ft walls, $5.81/sq ft for 14-ft walls) were provided. This cost was for the building shell only. Site preparation and floor would cost extra. For this analysis, a 16-ft tall building worked best for stacking the bales of Table 3 three high. Consequently, a cost of $6.00/sq ft was used. Recent cost increases for steel and lumber may make these values obsolete. 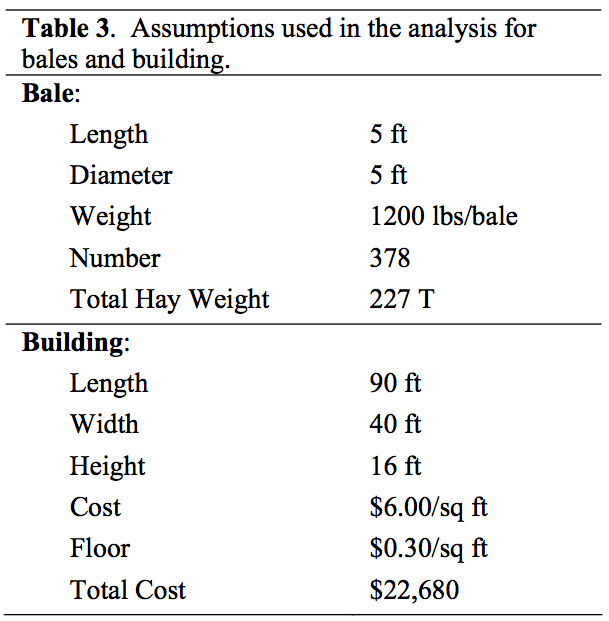 For this analysis, the assumptions for the hay stored and the building used for storing the bales are listed in Table 3. The bales are assumed to be stored three high in a long axis horizontal position with 8 rows on the bottom layer and 6 rows on the top. An alternative storage is a pad constructed of crushed stone known as macadam, Table 4. This material allows water to drain away from the bales and not wick up into the bales. This helps to keep the bottom of the bale drier and reduces loss compared to resting on soil. A pad only large enough to support the bales was used. In the analysis, a macadam surface was used alone or in combination with pallets. When combined, the macadam is probably needed to provide a good driving surface for the equipment used to load and unload bales. There is only a slight improvement in DM recovery (from reduced deterioration) when both pallets and macadam are used together. Thus it may be difficult to justify both if a drivable surface can be maintained without macadam. Pallets are sometimes used to elevate the bales above the ground. The cost of recycled pallets was used in the analysis. The crushed rock pad with tarp covering is the most cost effective system for 6-month storage (Figure 1). In the case of 6-month storage, storing the hay on the ground is quite similar to that of storing it on a crushed rock pad. Consider this system for lower price hay only when a tarp cannot be used. The other alternatives are much more expensive and will probably not pay for themselves. For the 12-month storage period (Figure 2), the crushed rock base with tarp covering is the lowest cost alternative. The other alternatives are again appreciably more expensive and should probably be avoided. The results of this analysis are appreciably affected by the assumptions used for capital costs and DM losses. Various methods of making round bales and the various weather conditions (moisture and temperature) will affect DM losses. Thus, producers should do their own analyses using the spreadsheet to include their own conditions and assumptions before deciding on their choice of a storage system. Using these assumptions, high capital cost systems do not justify their expense for both short- and long-term storage. 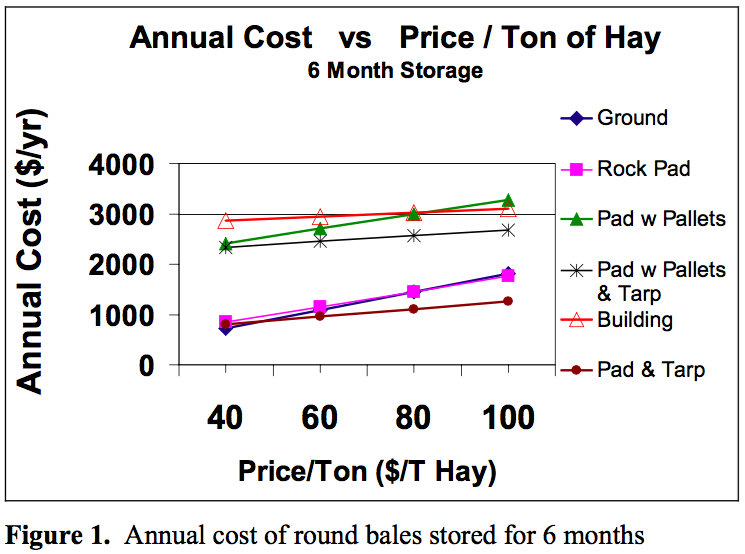 The rock base with tarp has the lowest cost for most hay values used during a 6-month storage period. The rock base without tarp has a similar annual cost to storing hay on the ground for the 6-month storage period. Thus, one might invest in this alternative to avoid high losses in a wet year vs. on the ground. The other alternatives are much more expensive and are not justified. 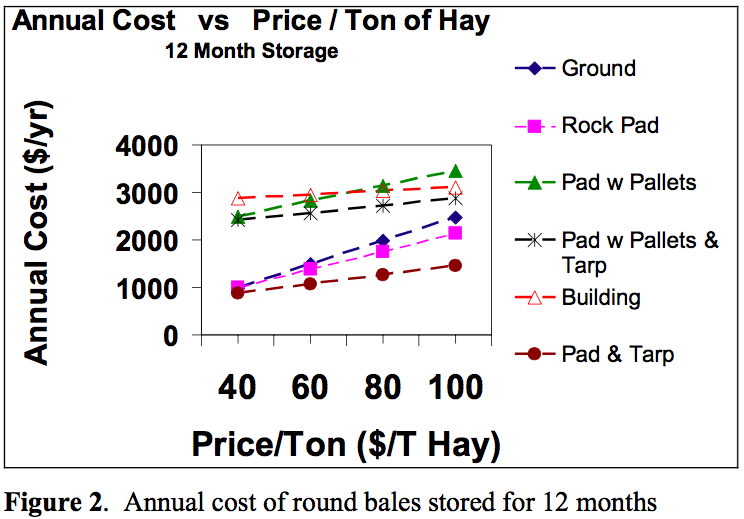 The rock base with tarp has the lowest cost for all hay values used during a 12-month storage period. The other alternatives are much more expensive and are not justified.